Next post: The Mighty Snow Leopards, Part 1. While we were in Uganda, we took a rafting trip on the Nile River. The Nile is famous because it is the longest river in Africa. It goes all the way from Sudan to Egypt. It’s very old. In the Bible, the baby Moses floats on it. We also saw the Nile in Ethiopia. There it looked more brown and dirty but there were some huge waterfalls with mist that looked a lot like steam. Unlike in Ethiopia, the Nile in Uganda was beautiful. The water was clear enough that you could see your toes. Green trees and bushes surrounded the banks of the river. There were hardly any buildings. We saw a lot of birds, especially cormorants and these huge birds called marabou storks. I also saw a crested crane. If you look up the Ugandan flag it has a crested crane on it. When we were rafting, we had a guide who did a lot of the paddling, and also a man in a mini kayak who followed behind us. 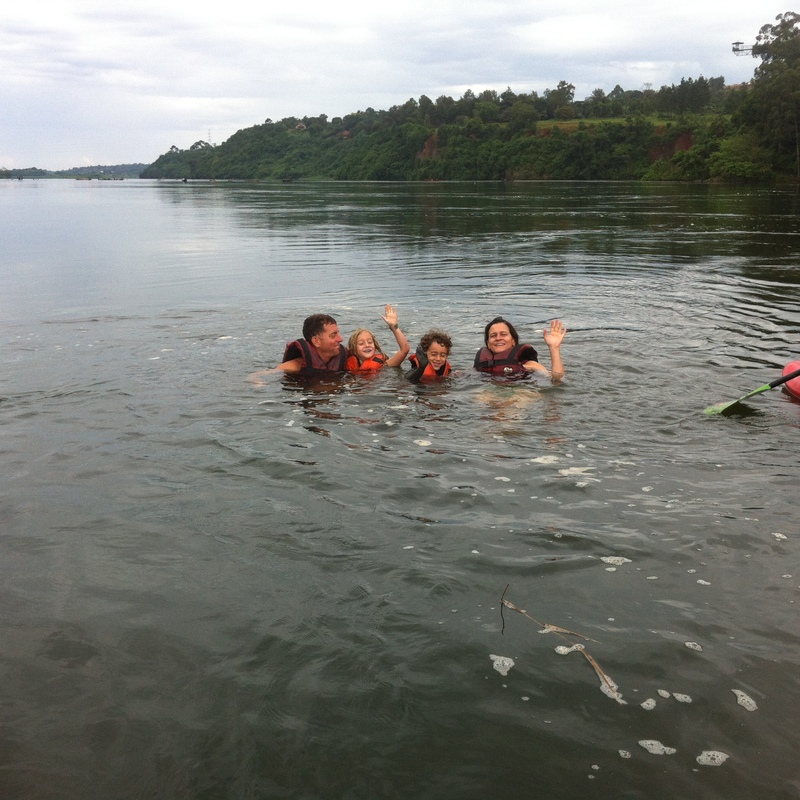 (Even though we had life jackets, the Nile can be dangerous.) Once we got going, the guide told us we could jump in the water. I was the first in our family to do so, because my dad pushed me off! It was so fun, especially when I floated on my back. I didn’t notice that I was moving but I looked at the side of the river and I saw that I had drifted a long way. Because of the life vest, you can try as hard as you can to get your head under water ‘but you just can’t. Our trip lasted about two hours. We passed a cave and our guide told us that a Ugandan president once hid his troops there in a fight against the previous president. It was a surprise attack! Speaking of surprise attacks: as we neared the end of our trip, I noticed that our guide had never been in the water, so I pushed him in! I didn’t notice that he wasn’t wearing a life jacket. Good thing he was a good swimmer or our raft would have floated off! Wow, Esme your rafting trip sounded amazing! My mom has read me stories about the Nile river, but to see one of my classmates in it is awesome! I had never thought of the Nile going anywhere but Egypt. I am not a kid but I really learn a lot of stuff with your reportages. I am serious. When you have a chance tell us about smells. I remember when I went to Senegal, I realized that smells were very different from what I was used of. It is great you have this journal, because growing old we forget (even if we think we will remember everything all our life) and you are going also to be able to remind Roman of this year all together discovering the world. Tom who reads over my shoulder said”she writes well.” I said that Nico is writing what you say. “In this case she tells well.” Many keeses little girl and to Roman.